Linen weave cardboard frame for 4x6 vertical prints with built-in A-frame easel and foil border accent. 25 frames per pack. Envelopes available separately. Availability: Non-imprinted ground orders usually ship in 2-3 business days. Exception - Gold Foil has a 4 pack (100 folder) minimum, 5 business days production time and no returns or exchanges.. Add To Cart to view ship rates and delivery dates. 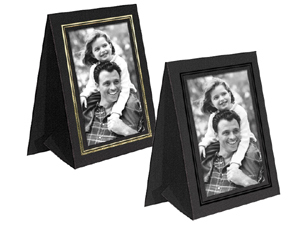 Frame all your photos and prints just like a professional studio photographer. This heavyweight paper photo frame is suitable for a variety of photographs including: Senior and school portraits, family portraits, engagement and wedding portraits, cruise and resort photography. Overall folded dimensions: 5-1/2" x 7-5/8"